Pines Wheatgrass - Babilon Arts, Inc.
Pines International is the original wheat grass company tracing its roots back to 1931. PINES supplies its customers with the high-quality cereal grasses, grown in rich glacial soils that have been used by scientists for dozens of studies published in major medical journals. 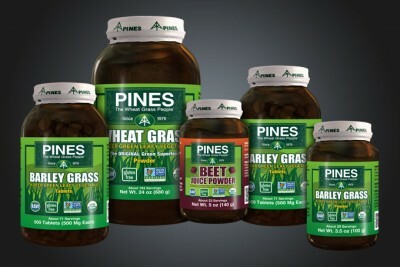 Available in powder, capsules and tablet form, PINES cereal grasses are grown as Mother Nature Intended. Pines has been a well established company and leader in the cereal grass industry, however they were facing several issues in the branding of their company. They felt their image was outdated. Being such a large company in the industry they wanted to develop a brand that would stand the test of time as well as provide them with a superior presence on the shelves. Another problem they faced was having inconsistent layout and verbiage in their product packaging as well as their marketing materials. The first step in rebranding the company was to redesign their logo. We wanted to honor the history of the company and provide them with a look that not only represents where they are going but also where they came from. The result was a clean “green” look with retro flare. Once that was completed we began to redesign their product packaging. It was important that the new packaging harmonized with the new brand identity and stay true to an organic look. We created custom illustrations for their range of products and designed custom logos to showcase each product’s selling points for being raw and gluten free. In order to streamline the look and content of the packaging we worked closely with a team of writers and marketing experts to ensure that the best information was infused in the design. The next steps were to expand the new brand in to marketing materials, ads, booth graphics, website support graphics, and 3d bottle renders. Having launched a successful rebranding campaign our efforts were recognized by GD USA. They named Pines International product packaging as a winner of American Package Design Award for 2014. We thank GD USA for the recognition and look forward to the next successful campaign.